You have heard it many times before: eating wild caught salmon is healthier than eating farmed salmon. But why is this and does it justify the big price difference? In my opinion, it does and here is why. In 2004 there was a study published in the Science Journal that looked at the contaminants in farmed salmon. They analyzed 2 metric tons farmed and wild salmon and concluded that farmed salmon had significantly higher contaminant levels than wild salmon. The farmed salmon contained higher amounts of chemicals such as PCBs, Dioxins, Toxaphene and Dieldren. PCBs are industrial insulators and lubricants. They were banned in the US in 1976 because they can stay in the environment for decades and can accumulate in the food chain. PCBs have been linked to cancer and numerous reproductive, neurological and developmental diseases. Dioxins are byproducts of high-temperature industrial and waste treatment and disposal. Yummy. Like PCBs, they persist in the environment for decades. They are a known cause of cancer in humans and have been linked to other developmental and reproductive diseases. They can alter the immune function and are toxic to fetal endocrine system. Toxaphene is a banned pesticide. High exposure can cause damage to the lungs, nervous systems and kidneys and can cause death. Toxaphene is a probable carcinogen and even in low doses has been linked to liver, kidney, adrenal glands and immune system problems. Dieldren, like toxaphene, is a banned pesticide and it can stay in the environment for decades. Studies have shown that it can cause cancer in mice and prolonged low exposure to the chemical affects the liver and the immune function. High exposure affects the nervous system. Buy it frozen – you can buy frozen wild caught salmon in your local supermarket like Safeway, Wholefoods, Trader Joe’s and even Costco. Buy it canned – almost every shop has canned wild caught salmon on the shelves. Buy it fresh – only when salmon fishing is in season. 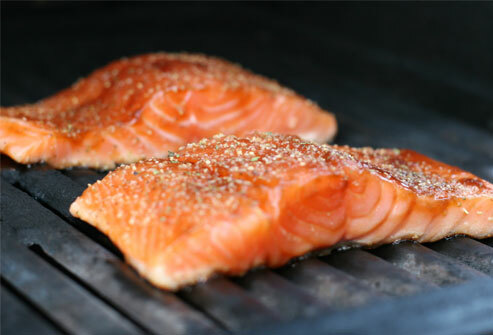 Fresh salmon tastes better than frozen and is worth the extra money. However if you buy ‘fresh’ wild caught salmon out of season you are paying higher prices for salmon that has been defrosted in the shop. My last comment to you is that not all farmed salmon is bad. Chum salmon does not have such high levels of chemicals and can be consumed much more often than other types of farmed salmon. However it is often impossible to know the type and source of the farmed salmon and so it is best avoided.